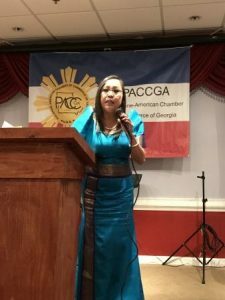 Norcross, January 15, 2019 — The Philippine American Chamber of Commerce of Georgia officially announced their 2019 officers and Board of Directors at the annual dinner gala. 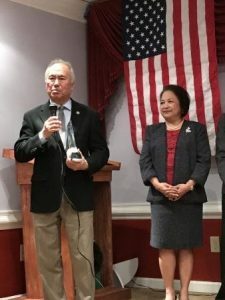 Anne Marie Logarta is officially inducted as the 2019 President of Philippine American Chamber of Commerce of Georgia at the installation ceremony. The installation ceremony was conducted by Philippine Honorary Consul General Ray Donato. Annaliza Thomas, State Director of the Certified Literate Community Program at the Technical College of Georgia delivers the keynote address at the dinner. Anne Marie Logarta-President, Mary Jane Rolen-Secretary, Maria M. Annunziata-Treasurer, Zhee Almost-Membership Director, Pia Valeriano-Public Relations, Isabel Fiorello-Program & Events Director, Mayette Bayani-Audit Director, Cecil Pacetti-Finance Administration, Eleanor Mae Pascual-Community Outreach Director, Bryan Ramos-Tourism & Trade Director, Cherish Dela Cruz-Legal Counsel, Ana Blackburn-Immediate Past President.